it's a funny day to actually blog about feelings but i'm doing it anyways. so during the break, i watched my nihon-go talking cardcaptor sakura CDs (without the translation, mind you.. i couldn't really get what they're saying if i hadn't got a printed out book of the transcripts. heh!) and it reminds me how much i like.. no. 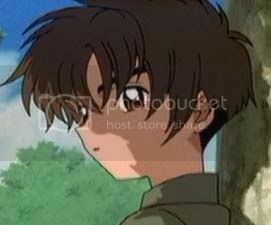 like liiike syaoran! 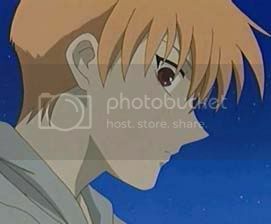 and then it sort of hit me.. how similar shaoran and kyou actually are! hihi. and that kinda said to me that those similarities could probably be the thing i'm looking for (if i am looking) in a guy. hihi! suki!! by the way, i am bored. can you tell?